This post will guide you through properly setting up a connection between your phone and your TV to play your videos or view pictures on a larger screen for others to see. This connection will require you to buy a specialized Samsung adapter. Step 1: Plug one end of the HDMI cable to the HDTV's HDMI port and the other end to the port on the Samsung HDTV Smart Adapter. Step 2: Plug the charger to the power source and insert the microUSB to the port found on the Samsung HDTV Smart Adapter. At this point, the adapter is already powered up. Step 3: The built-in microUSB port from the adapter should be plugged-in to the port on your Samsung Galaxy S5. Step 4: Now get the remote control of your TV set and set it up to stream from the HDMI port where you plugged the cable. If all connections are good, which is most likely, your HDTV will immediately mirror what's on your phone's screen. You will also need to buy another Samsung equipment to be able to wirelessly mirror your phone's screen to your TV set. Step 1: Plug one end of the HDMI cable to the port on your HDTV and the other should be on the port found on the AllShare Cast Wireless Hub. Step 2: Plug to the power adapter to the power source and plug the microUSB to the port on the hub. The AllShare Cast Wireless Hub will be powered up and the indicator will start blinking. To make the hub ready, find and press the Reset button on the hub. 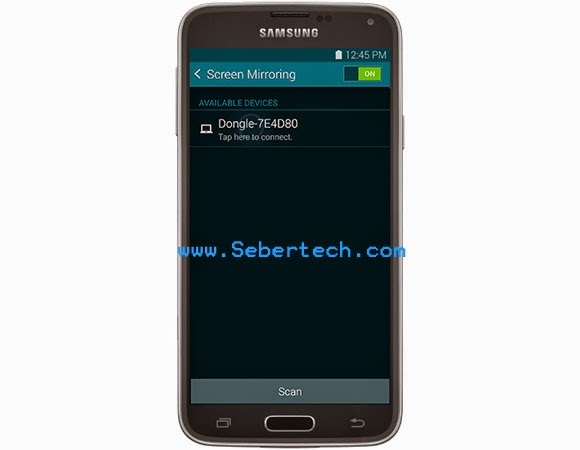 Step 3: Now, on your Samsung Galaxy S5, go to Settings > Connect and Share > Screen Mirroring. Step 4: The phone should be able to detect the dongle so tap on it to automatically connect. That's pretty much it! I hope this tutorial can help you.